After numerous times trying to hit up Supermaxi with fellow food blogger wankster Alex from The MSG, we finally made it. We kept postponing due to forgetting, insomnia, brokearsedness, work – you name it, it happened. In case you’re not aware, The MSG is having a pizza battle and seeing as Supermaxi is sort of out my way, I asked Alex if I could tag along when he was planning to eat there. You can’t tell from the outside at all what lurks inside North Fitzroy relative newbie Supermaxi – its exterior is modest to say the least, verging on hidden, even. It is easy to get to as it’s located along the 112 tram route that heads to West Preston. Inside, it’s sleek, sterile and spacious (how’s that for alliteration!). When I arrived, there were some complementary lupini beans for nibbling. Tasty but trickier buggers than edamame. Of course Alex ate them with more grace than I did and I believe they are enjoyed in Arab countries too. 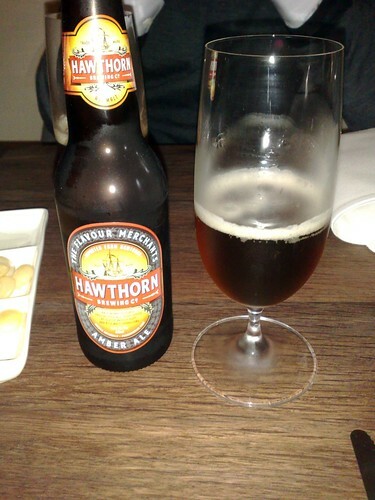 To drink, I chose a beer from a local (Melbourne) brewery – the Hawthorn amber ale. Malty and very sessionable. Sorry the photo is so…flashy. I have since found out that the Hawthorn brewing premises are located in Mildura, near the NSW-Vic state border. Not so local after all…? Alex tried a Kooinda pale ale, also a (physically) Melbourne-based brewery. I think he probably would have enjoyed the amber ale more as the Kooinda can be bitter for those who don’t generally drink beer. Time for pizza choices. 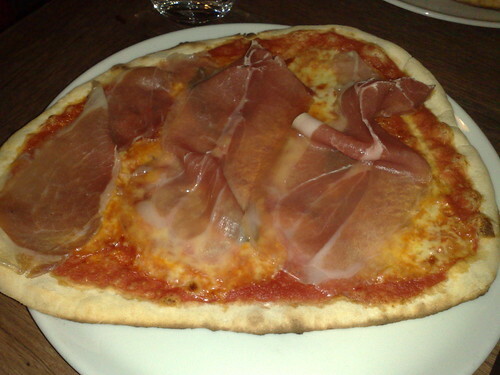 I went with the special offered on the evening which had smoked mozzarella, basil and prosciutto on a tomato base. Cheese, cured meat and a beer. My holy trinity of vices. You could actually taste that the cheese was smoked but the meat detracted from that a little. A nice thin base but a little soggy towards the middle. I think I might have liked a little more basil and less prosciutto so that the smoked cheese flavour would linger more. Don’t get me wrong – it was delicious and I finished it. 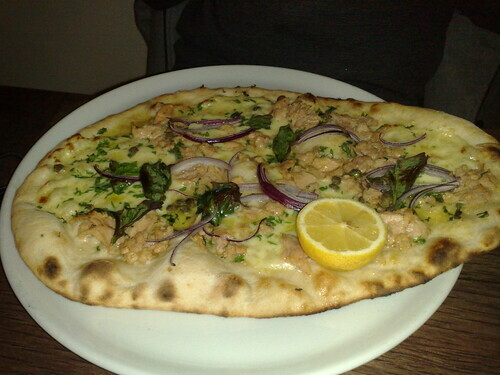 Alex chose the Sicilian – a distinctly different pizza from mine – which had tuna, onion, capers, basil, parsley, mozzarella, lemon and chilli and is not tomato-based. I’m pretty opposed to fish on a pizza but I have to concur with Alex – he got the superior pizza. Really bloody good. Wouldn’t mind a tad more chilli on it. Definitely give this pizza a go even if it sounds a bit odd. I’m very glad I got to try it as it’s not something I would have chosen. Alex was fancying dessert and even took pity on my Dickensian status to make sure I got some too which was very kind. 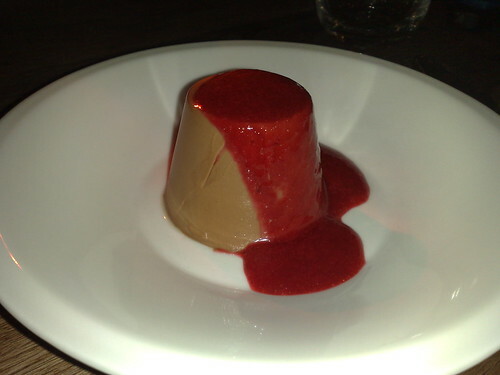 I selected the chocolate pannacotta with raspberry sauce. I would have preferred the pannacotta to be a tad creamier, but it was otherwise quite good and chocolate always goes well with tart fruit sauces. 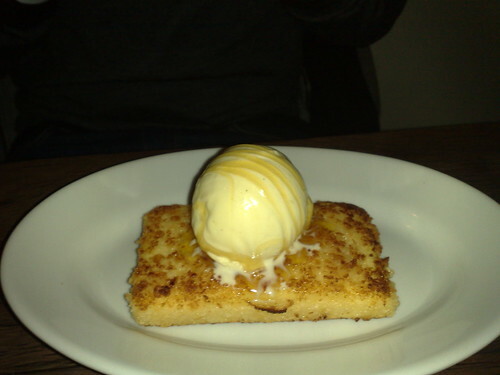 Alex went for the fried custard with honey and vanilla ice cream – the texture of the fried custard was trippy! It was like baked cheesecake with a crunchy crust. If you want to see how Alex has got on with the MSG’s epic pizza battle (seriously, these food blogger wanksters have it hard! They eat and eat and eat and eat just so they can tell you where all the cool places are! *wink*) here’s the link to heat one. 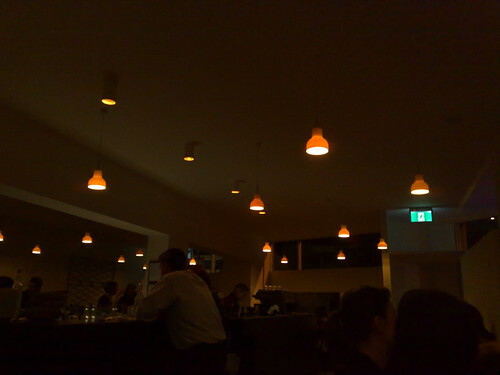 This entry was posted in eatie-foodies dining out and tagged gourmet pizza, Hawthorn amber ale, Italian food, Melbourne, North Fitroy, Supermaxi on July 30, 2010 by gem. Huh, I’m surprised that you had weird service! It was impeccable the night that we visited. I guess every night’s different – the desserts certainly look different… and DELICIOUS. Our main waitress was fab, it was just that other waitress who we initially ushered over that wasn’t assigned service in our area…but it’s a minor quibble. I’d still recommend Supermaxi – their pizzas were delish after all! And yes, dessert was lovely, as to be expected! I bet once I start cooking more I’ll eat out less so I can hardly blame you! Ashley, yes! They have a full Italian menu aside from the pizzas available. It’s still worth checking out. I’m still keen to go again.